“I don’t know whether the chicken-based dishes sold at popular fast food restaurants have antibiotics and are a potential source of antimicrobial resistance. However, I have heard of incidences where antibiotics became ineffective in treating illness,” says Nitin Rawat, resident of Ghaziabad. It is estimated that antimicrobial resistance (AMR) will cause 10 million deaths per year and loss of outputs worth US$100 trillion by 2050. In India, it is becoming increasingly difficult to treat common bacterial infections because the pathogens that cause them have become resistant to antibiotics. AMR can lead to greater spread of infectious diseases, uncertainty in success of high-end procedures, longer hospital stays and more expensive treatments. The misuse of antibiotics in food-animal production, especially for growth promotion, is a key contributor to rise of AMR. India’s rapidly growing fast food industry, which uses meat raised with antibiotics, is a key contributor to the worsening AMR situation. Currently, there is a huge momentum worldwide to combat AMR. After the adoption of World Health Organization (WHO)-led Global Action Plan on AMR at the World Health Assembly in 2015, many countries have developed their National Action Plans (NAPs) on AMR. Recognising the need to preserve the effectiveness of antibiotics that are used commonly in human and animals, the WHO developed a list of critically important antimicrobials (CIAs) for humans. Combating AMR also received global political support at the United Nations General Assembly in 2016. Some developed countries, particularly those of the European Union (EU), have addressed AMR through systematic policy and practice initiatives. For example, the use of antibiotic growth promoters (AGPs) in animals was banned in the EU in 2006. India still allows such use. India experiences rampant use of antibiotics for non-therapeutic purposes (growth promotion and disease prevention) in poultry farms, according to an investigative report published by Bloomberg in March 2016. Usage of approved antibiotics by fast food brands such as KFC and McDonald’s was among the key highlights of the report. A 2017 global study projects over 80 per cent increase in antibiotic consumption in livestock by 2030 in India. Currently, two-thirds poultry farms in India use antibiotics for growth promotion, and has also been estimated that consumption of quinolones, macrolides and polymixins is estimated to grow by about 250, 90 and 160 per cent respectively. A 2017 study by the Centre for Science and Environment (CSE) on antibiotic resistance in poultry farm environment found routine antibiotic use in all poultry farms surveyed across four states in North India. Antimicrobial resistance (AMR) emerges when microorganisms survive exposure to a drug that would normally kill them or stop their growth. Antibiotic resistance (ABR) is resistance to antibiotics that occurs in bacteria. It is globally recognised as an emerging threat to public health as antibiotics are increasingly becoming ineffective against disease-causing bacteria. 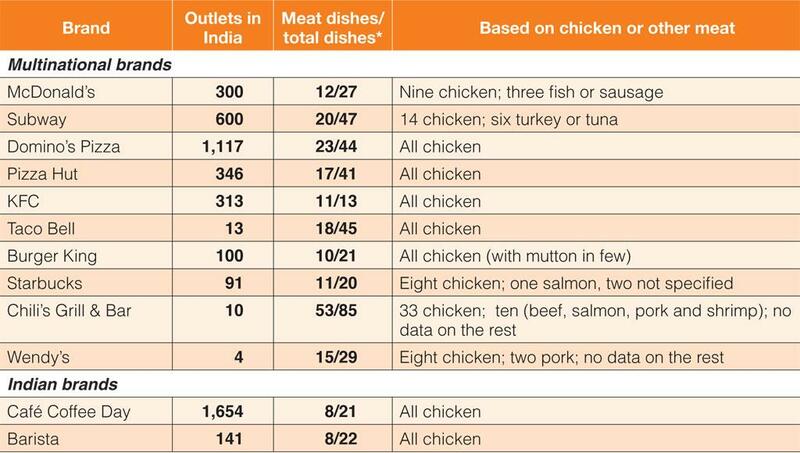 Researchers at Bhabha Atomic Research Centre, Mumbai, reported the presence of drug-resistant Salmonella in ready-to-cook poultry products in 2017. Multi-drug resistance was reported towards five or more antibiotics. “I was suffering from seasonal infection this summer and was given heavy doses of antibiotics since my medical reports showed bacterial resistance towards multiple antibiotics,” says Fatima, resident of New Friends Colony in New Delhi. In response to the growing momentum to reduce animal use of antibiotics and pressure from consumers and investors, along with campaigns by civil society, several US-based multinational companies (MNCs) have come forward and made commitments to reduce antibiotics in their supply chain. Globally, fast food companies have come out with measurable objectives and clear-cut timeframes to reduce and eliminate such use in many countries, including in the US. By the end of 2017, most fast food companies would already have eliminated medically important antibiotics from chicken supply chain in the US and the remaining would do so before 2020. However, when it comes to India, these companies show double standards and are vague about reduction or elimination frameworks and timelines. This double standard does not augur well for India. 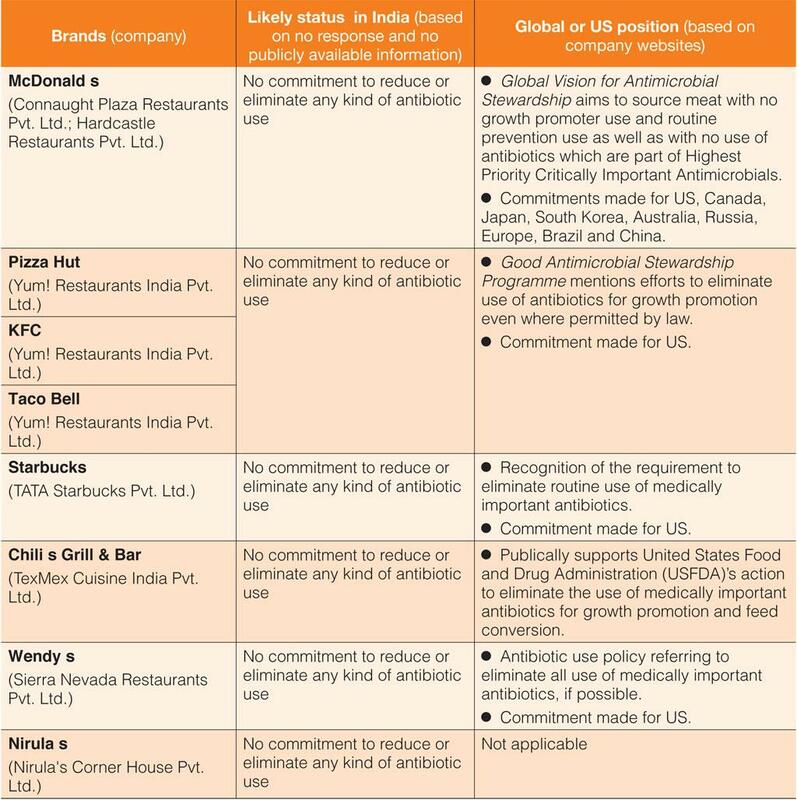 To understand what the global fast food industry and some popular India-based brands are doing about AMR in India, the Centre for Science and Environment (CSE) conducted a review of their policy and commitments. It wrote to 12 fast food companies managing 14 key brands in India (see Box: CSE queries). These included nine companies operating 11 multinational brands—mostly of US-based global giants—which are leading the Indian fast food industry. Three more brands included in the review were those managed by three Indian companies. None of the companies were found to have any time-bound commitment specific to India. McDonald’s, which aims to eliminate antibiotics considered critically important to human medicine in countries other than US, chose not to respond to CSE’s queries. It has 300 outlets across the country and serves about nine chicken-based dishes out of the total 12 meat dishes. McDonald’s aims at sourcing meat not treated with antibiotics for non-therapeutic purposes. “Antibiotics can only be used under veterinary supervision; routine preventative use is not permitted,” says Becca Hary, Director Communications, McDonald’s Corporation. The company, which recently provided time-bound commitments to eliminate the use of Highest Priority Critically Important Antimicrobials in Europe, Canada, Brazil, China, South Korea, Japan, Australia, Russia and US, seems non-committal when it comes to India. Similarly, Yum! Restaurants India Pvt. Ltd., managing Pizza Hut (346 outlets), KFC (313 outlets) and Taco Bell (13 outlets), did not respond to CSE’s queries and also do not have any India-specific commitment despite global counterparts making international efforts to eliminate use of antibiotics for growth promotion in countries where permitted by law. Starbucks, which has a fair presence (91 outlets) in India, also did not respond. It has, however, made a commitment to eliminate routine use of medically important antibiotics in the US. Wendy’s (4 outlets) and Chili’s Grill & Bar (10 outlets)–both the brands which are in a position to address AMR because of smaller supply chains—also did not respond. But the same Wendy’s has committed to eliminate all antibiotics important to human medicine from chicken production by 2017 and would come up with a commitment for pork and beef in 2017. Chili’s Grill & Bar has no commitment in the US. 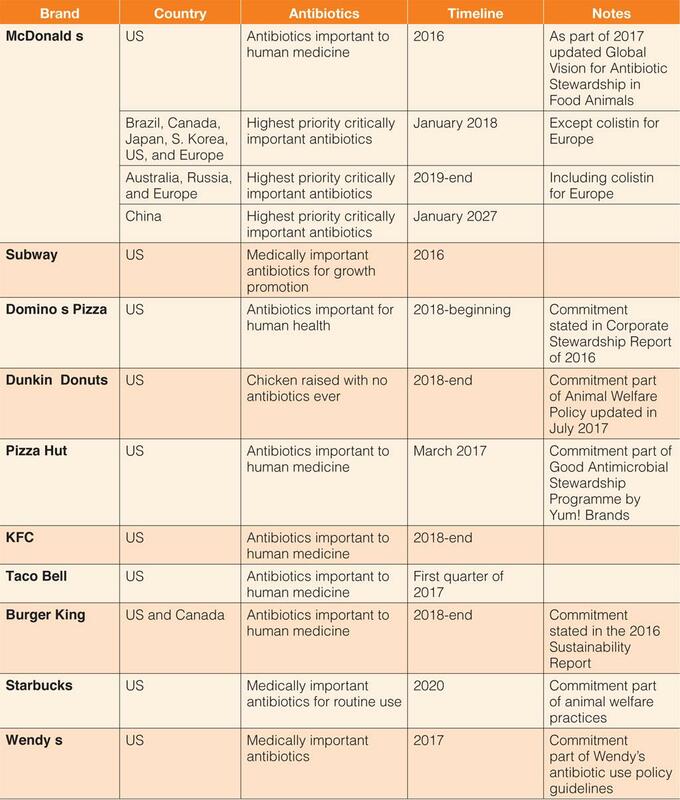 Lack of information in public domain and hideous silence suggest that these fast food companies have no commitment to reduce or eliminate any kind of antibiotic use. Their antimicrobial stewardship is restricted to the US, Canada, Europe, some parts of Asia and S America. Nirula’s was the only Indian brand which did not respond. India’s organised food service market includes quick service restaurants (KFC, Domino’s Pizza, and cafes such as Starbucks and Barista). They accounted for $2.4 billion in 2014, with a projected growth of up to $5.5 billion by 2020 at a compound average growth rate of 15 per cent. Chicken-based dishes are an integral part of their menu. Five companies (operating six brands) responded (see Table 3: Analysis of responses from fast food companies in India) to CSE’s queries. These included four multi-national brands: Subway, Burger King, Domino’s Pizza and Dunkin Donuts (managed by Jubilant FoodWorks Ltd.), and two Indian brands—Café Coffee Day and Barista. Among these, none shared an India-specific time-bound commitment to reduce or eliminate antibiotics in supply chain. None of the responses were adequate enough to address the issue of AMR. Typically, their responses conveyed how sourcing is done through approved suppliers and that necessary quality, testing and audits are conducted. 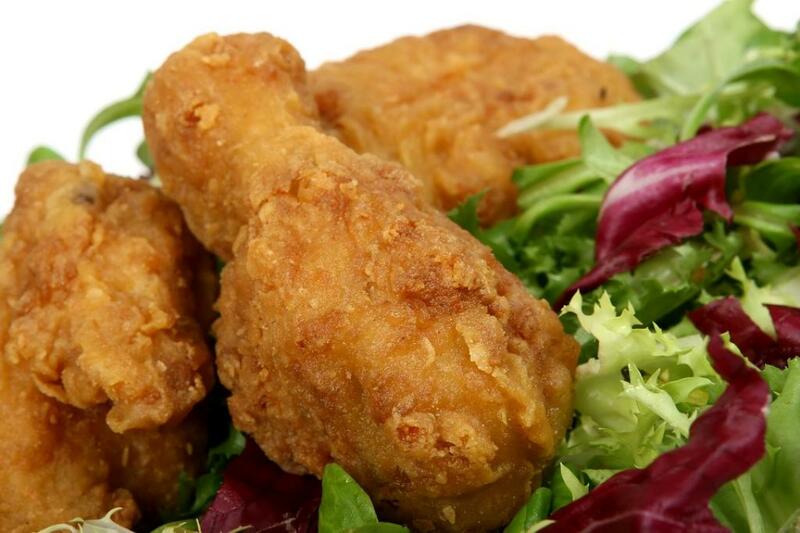 “Vendors supplying raw processed chicken, processed meat and eggs are our approved suppliers. The vendors for chicken, meat and egg have informed that the products supplied to Ambassador’s Sky Chef, Mumbai in general circumstances are processed to ensure that they do not possess any antibiotic residue in the final product,” said Ambassador’s Sky Chef, Mumbai (one of the vendors of Barista) over an email that was forwarded by Rajashekar Saladi, Corporate Chef, Barista Coffee Company Ltd. Despite requests, no test or audit reports were shared. 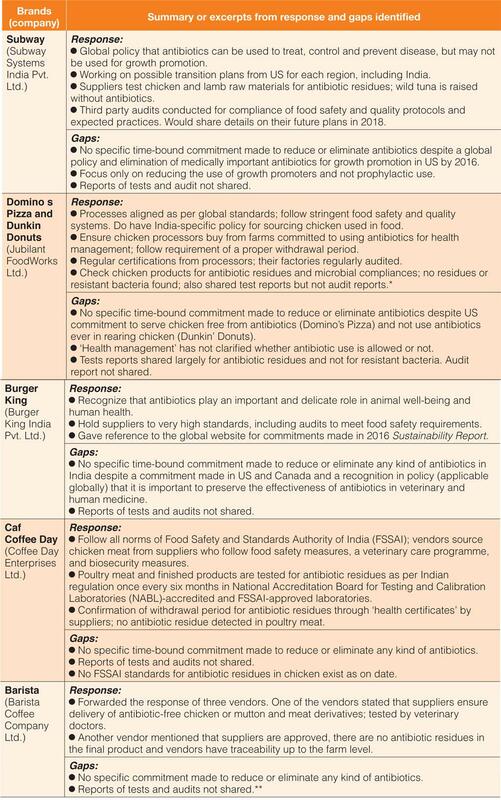 In a curious case of knowledge gap, some companies claimed following Indian norms, when, in reality, there are no standards set by the Food Safety and Standards Authority of India (FSSAI) for antibiotic residues and resistant bacteria in chicken till date. “We ensure that poultry meat and finished products are tested for antibiotic residue against existing Indian regulation once in six months from third-party NABL-accredited and FSSAI-approved laboratory,” said Suju Datta, Senior GM Quality Assurance, Café Coffee Day. Subway mentioned the possibility of plans to transition learnings in India but did not share the lab and audit reports that were stated in an email response. “Our suppliers in India test all of our chicken and lamb raw materials for antibiotic residues. We also use third-party audits to ensure strict compliance to our food safety and quality protocols and expected practices,” said Ranjit Talwar, Country Director, South Asia, Subway. The company has committed to eliminate the use of medically important antibiotics for growth promotion in the US. Initial focus has been on poultry supply chains that has already been completed. Transition for turkey is to happen by 2018-19 and for pork and beef by 2025. ‘Health management’, as stated in a response by Jubilant FoodWorks Ltd., does not clarify whether antibiotic use is allowed or not. “Jubilant Foodworks ensures that its chicken processors buy chicken from farms which are committed to using antibiotics only for health management and proper withdrawal period is followed before slaughtering of birds,” said Avinash Kant Kumar, Executive Vice President, Jubilant FoodWorks Ltd. However, Kumar stated in a verbal response that the company is currently working towards addressing AMR in India­­. Jubilant FoodWorks Ltd. was the only food company that shared lab test reports. However, those reports were largely for antibiotic residues. Audit reports were not shared. In the US, Dunkin Donuts has committed to not use antibiotics ever and Domino’s Pizza also confirmed their commitment to not use antibiotics. Audit reports were not shared by any of the companies. Burger King (100 outlets) referred to its commitments of eliminating antibiotics important to human medicine in the US and Canada. All multi-national companies, which have specific commitments in the US, are focused mainly on chicken supply chains, with few having timelines for other food animals such as turkey, pork and beef. Companies managing both Indian and foreign multinational brands must contribute to halt rising AMR by making time-bound commitments specific to India. The multinational companies, which know the best practices of their global counterparts, must take a lead in this. Commitments should be about eliminating all non-therapeutic use of antibiotics and preventing use of any antibiotics, which is recognised as critically important for humans, in their supply chains. To achieve the commitments and share the status of progress, third-party supply chain audits, laboratory testing for antibiotic residues and resistant bacteria, and documentation of antibiotic use should be made an integral part of the process. The documents should also be put up in public domain. While fast food companies must take a lead, policy makers must also address the issue of antibiotic use in food-animals beyond the fast food industry. Use of antibiotics as growth promoters must be prohibited. The FSSAI must develop standards for antibiotic residues and resistant bacteria for food from animals, besides conducting periodic surveillance and making it public. The FSSAI should also develop labelling laws, making the consumers aware about the use of antibiotics in rearing food-animals. Producers of food-animals like poultry and fish, who supply to the fast food companies should proactively support the commitments made. Big institutional buyers like hotels, hospitals, airlines and railways should also work towards developing similar policies and commitments towards sourcing food from animals.